Following a week of intense weather, the team faced a new set of challenges in week two on Great Abaco Island. Late in the afternoon on Monday, April 30th, Titan was lifted off the transport flat rack and placed on the platform. The team promptly began internal systems checks and unfortunately, it did not go as expected. We encountered sporadic behavior from the internal electrical systems and after several tests and a thorough evaluation, it was determined that, while Titan was not directly struck by lightning, the electronics experienced significant damage from the electrical currents generated by the onslaught of lightning storms. We quickly made the call to fly several members from the OceanGate engineering team into Marsh Harbour from Everett. Mark Walsh, our lead electrical engineer arrived in Marsh Harbour Tuesday afternoon and jumped right in. After determining that the anomalies were in fact due to lightning damage, he quickly began replacing all the electronics and wiring. After a long day of hard work by the operations team and Mark, the thrusters were installed and working by 8 PM. For Mark this is familiar territory, having previously been on Maintenance Recovery Teams (MRTs) in the Air Force where he would deploy to remote locations to diagnose and repair aircraft that suffered damage from lightning. Tony Nissen, the OceanGate Director of Engineering, arrived in Marsh Harbour Wednesday afternoon to help Mark finish the rewiring and ensure that all electronics were in proper working order. The team replaced several other damaged electrical systems and by the end of Thursday, the engineering team was pleased to share that most systems were back online. With two additional electrical technicians arriving on Saturday, Titan was expected to dive by the end of the day on Sunday. 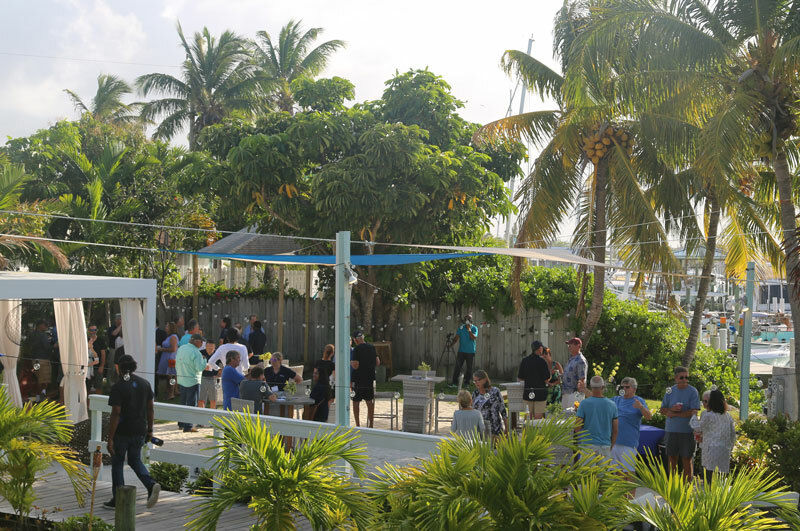 The continuation of stormy weather ultimately delayed the first Bahamas dive until Tuesday. Our post transport inspection process combined with a modular submersible design and a great deal of preparation took what could have been a catastrophic event and made it into a minor setback. Despite the challenges, the team is moving forward with the dive plan to reach 4,000 meters next week after a series of incremental depth dives. The entire team was in awe of the spectacular show produced by the lightning storms as they rolled over the Abaco Islands. However, as lightning struck down all around the Marsh Harbour Boat Yard for hours on end over the course of several days an increasingly large magnetic field was generated by the current. While none of our equipment, or the sub, was plugged into local power lines this current was powerful enough to damage the electrical boards and cause extensive damage to the electronics used to operate Titan. Our engineering team rewired the entire electrical system, replaced hard drives, software, and hardware inside of Titan. Fortunately, iXblue PHINS and Posidonia units were not damaged. The 2G Robotics Laser scanner, SubC Imaging 4K camera, and Lights from Deep Sea Power and Light were also unharmed. Going forward our team will take reasonable action to prevent this from happening again, but also understand that this was a very rare occurrence, with an unfortunate combination of conditions which led to the perfect storm. Titan is constructed out of conductive materials including titanium and carbon fiber, not to mention, Titan was sitting on the steel transport flat rack in the middle of an open boat yard surrounded by tall masts from nearby sailboats. All of these factors played a role in what is likely a fluke incident and we believe that our talented and very well-prepared team, along with Titan’s modular design is what saw us through this setback. While the engineering team worked through the electrical challenges, the Operations team took every measure to ensure Titan would be ready to dive as soon as it was back online. 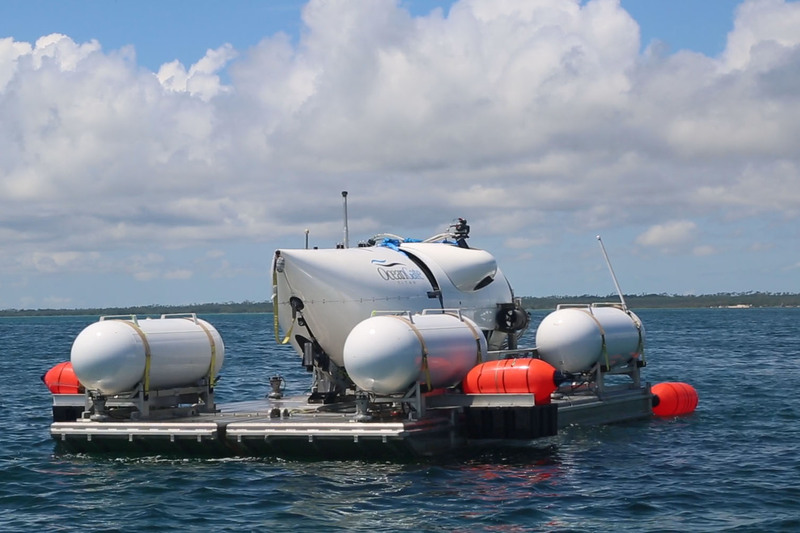 They completed several test dives with the Titan Platform in the Marsh Harbour Boat Yard. After the initial dunk, the internal ballast was adjusted, and the team towed the platform to a remote dive site for additional testing. 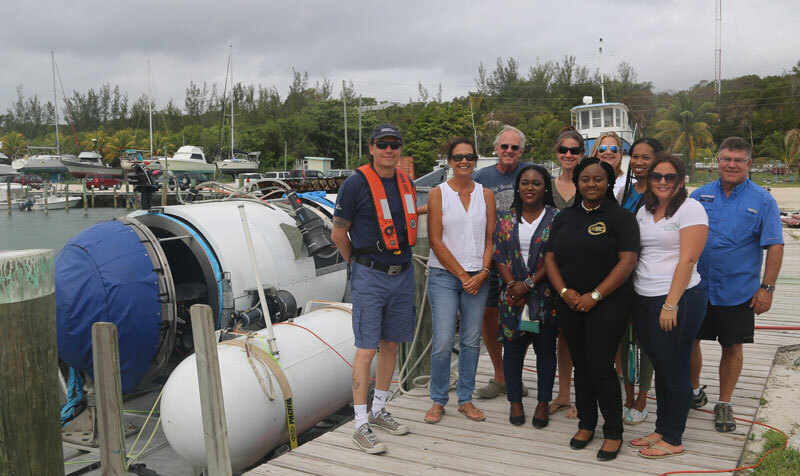 After a series of successful dives, the team went on to conduct dive recon on several sites in the Sea of Abaco in preparation for the series of Titan test dives to come. Week two was not without its challenges. Despite the various delays, our team rallied together and faced the setbacks with determination and focus. Proper tools, spares, and preplanning took what could have been a mission ending disaster and turned it into a bump in the road. After two days of systems checks, the engineering team signed off that Titan would be ready to dive on Monday. 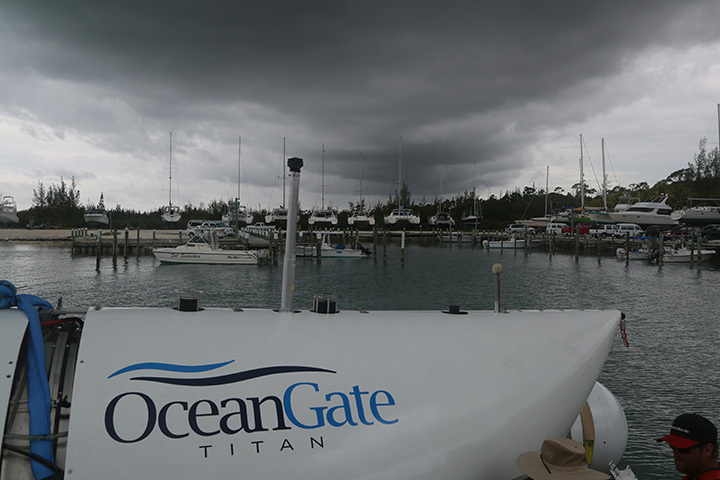 The team spent Sunday morning preparing Titan for its first Bahamian shallow dive which was completed today. As the week progresses we hope to dive deeper and deeper each day this week as we work toward our goal of 4,000 meters. While we are confident that the damaged electronics have all been replaced, lightning damage is notorious for causing weaknesses in circuits that can manifest themselves in anomalous behavior for months in the future. We will be on the watch for such activity and expect to be able to recover if systems are compromised. Another storm rolling in over Titan. 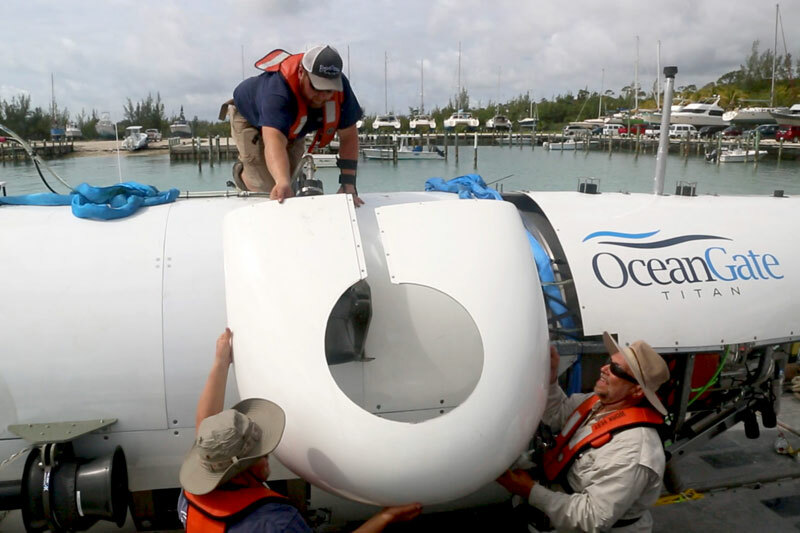 The team installs the fiberglass fairing for the portside vertical thruster. Our new friends from Friends of the Environment take a tour of Titan. Connecting with the supporters in Marsh Harbour at our Open House. Titan and platform on a calm day in the Sea of Abaco.